Today, in the Supreme Court, the Modi government once again revealed its true colours. Some petitioners are seeking to have the Forest Rights Act struck down. In the face of this grave threat to millions, no lawyer argued at all for the Central government – even after three senior opposition leaders and people’s organisations had raised this utter negligence in a letter to the Prime Minister. The Supreme Court heard only from the petitioners – wildlife organisations that have a history of misleading claims about the Forest Rights Act – and from a lawyer representing an organisation of affected tribals. The Centre’s callous neglect resulted in a one-sided hearing where the petitioners tried to claim that everyone whose claim has been rejected is an “encroacher” who should be evicted (even though both the UPA and the NDA governments have repeatedly admitted that many rejections are illegal). Fortunately the Supreme Court did not go along with this – the Court did not direct the eviction of those forest dwellers whose claims were not accepted. Instead, the Court has asked State governments to report on steps taken in case of rejections and to complete reviews of rejections within four months; and has also asked the Forest Survey of India to provide satellite imagery of forests to assess forest destruction. The petitioners in these linked cases against the Act, all of whom are retired forest officials, ex-zamindars, or a handful of wildlife organisations (Praveen Bhargav of Wildlife First, Kishor Rithe of NCS, Harshvardhan Dhanvatey of TRACT, the Wildlife Trust of India, and others listed below) have a history of misleading statements about forest dwellers. In 2014, several of India’s top conservation scientists, environmental NGOs and forest rights groups had jointly asked the petitioners to withdraw as their “petition is likely to facilitate the accelerated loot of this country’s natural resources” and endanger the livelihoods of millions of people. This plea fell on deaf ears. The Central government’s deafening silence makes clear that the apprehensions were correct – the government most likely sees this petition as a backdoor to sacrifice the Forest Rights Act. For more information on these cases, please see here. NB: This letter was endorsed prior to the resignation of Shri V Kishore Chandra Deo from his post as Chair of the Adivasi Congress. But far from sending a senior law officer to defend this critical law, in the last three hearings – in March, May and December 2018 – the Central government has said nothing. Your Ministry has been represented by a standing counsel with no stature. The petitioners have been asking the court to evict people whose claims have been rejected, when your own Ministry has admitted that many rejections are incorrect and require review. But in the recent hearings your lawyer has not even bothered to remind the Court of this. This is putting lakhs of poor tribal and forest dwelling families at risk of being evicted just because of the bias and illegal actions of officials. When these cases were first filed, the then UPA government had appointed Sr. Adv. Fali Nariman, one of the country’s seniormost lawyers, to defend the Act. Up to early 2017 your government was at least represented by a senior ASG – Sr. Adv. PS Narasimha. But now your Ministry is silent. Has it been decided that this Act should be sacrificed, perhaps to appease big corporates or other vested interests? Today (Wednesday, June 6th), Maharashtra police arrested Mahesh Raut, an activist in Gadchiroli, along with Sudhir Dhawale, Surendra Gadling (a senior lawyer) and Shoma Sen. All of these people are prominent, well-known faces in the struggle for social justice in Maharashtra. Mahesh Raut, in particular, has been affiliated to the Gram Swaraj Parishad and CSD and has spent years organising movements and struggles for forest rights in Gadchiroli, including village ownership and sale of tendu patta and bamboo. He has also been involved in working for people’s rights in the face of illegal land takeovers for mining in the area. This is not the first time Mahesh has been targeted – for years the police have been trying to claim he and his co-workers are Maoists, even though the charge is absurd. Indeed, the charges against those arrested are even more absurd this time than earlier. In press reports, police officials are quoted claiming that the Maoists paid these activists money to incite violence at the Bhima Koregaon rally. This is the same police force that has exonerated Sambhaji Bhide and done precious little to tackle the Sangh Parivar groups that openly attacked people at Bhima Koregaon. This is clearly a politically motivated case intended to target those who have been working for democratic rights and basic freedoms in a BJP-ruled state. We condemn this naked exercise of state repression and demand the immediate release of those arrested. On the morning of May 8th, at 4 am, Vijay Bhaskar Reddy suffered a heart attack after internal bleeding and passed away in Hyderabad. For many of us Vijay Bhaskar was both a friend and a comrade. For decades he worked on adivasi issues in undivided Andhra Pradesh, and then in both Telengana and AP after the division of the state. He was in touch with communities in remote areas and closely involved in their struggles, ranging from the movement against the Polavaram dam to the illegal descheduling of Scheduled Areas during the division of the state. He traveled up and down the state for his work and fought tirelessly for the rights of the people he loved and the communities he believed in. He was involved with us in the Campaign from our founding in 2003 and during the most intense years of the struggle for the Forest Rights Act, he was wherever the movement needed him to be, in the forests, on the streets, in Delhi and in the halls of Parliament. On top of all this he had an enormous amount of information at his fingertips, able to recall details of historical documents and policy issues across the board. His accomplishments were all the more amazing because he did them despite suffering from debilitating problems in his vision, which made it very difficult for him to read or to see clearly. In the face of those difficulties many would have chosen an easier life. But not Vijay Bhaskar. Over the years many of us got used to the fact that, once every few months, we would get a call from Vijay Bhaskar late at night, in order to discuss some detailed technical point or some new development in the struggle. In the face of everything he never gave up. Now it is difficult to believe that those calls will never come again. One more extraordinary person has left us. We will miss you, Vijay Bhaskar, and hope that one day we will see the dawn of the just world you fought for. But Dr. Vardhan’s statement is completely false. In reality, the government has been systematically and criminally violating the rights of millions of people, putting them at risk of harassment, eviction and being killed in the name of “wildlife conservation.” This began under the UPA government and has been converted into wholesale, systematic sabotage by the BJP at the Centre. On March 28th, the National Tiger Conservation Authority issued a completely illegal direction that barred recognition of any of the legal rights of forest dwellers in tiger reserves under the Forest Rights Act. This deprived lakhs of people of the protection of law. In BJP-ruled State after State, State governments have framed “village forest rules” that directly violate the FRA. The Centre tried to do the same with a draft “National Forest Policy” that ignored the forest rights issue entirely. Illegal grabbing of forest dwellers’ lands, both for corporate projects like mining and in the name of wildlife conservation, has continued across India. In the budget this year (2017), the government effectively shut down the program of providing minimum support price for non-timber forest produce – one of the most crucial sources of livelihood for forest dwellers. Despite the FRA permitting relocation from critical wildlife habitats only where coexistence can lead to irreversible damage and only with the informed consent of communities, under Central urging, many states have initiated wholesale relocation in total violation of the law, often using CAMPA funds. If this is the government showing “leadership”, then we can only hope that it shows less of this kind of “leadership” and starts showing more respect for the law and for the basic rights of the tribals and forest dwellers of this country. In violation of every form of justice, rights and humanity, the Central and Madhya Pradesh governments are attacking the families affected by the Sardar Sarovar dam yet again. Everyone involved is aware that those being displaced by this dam are not even receiving shelter fit for animals – and yet the BJP governments at the Centre and the State are pushing ahead with forcing them out. It is a telling testimony on the quality of justice in our country that not a single institution is willing to stand up for those struggling for these most basic of rights. It is an even more telling comment that the leaders of that struggle, including Medha Patkar, have been on fast for more than eight days and have received no attention from the media, state institutions or the ruling party. We in the Campaign extend our solidarity and support to the struggle of the people of the Narmada basin, whose bravery and commitment have inspired generations of Indians to fight the brutality of the system that we live under. 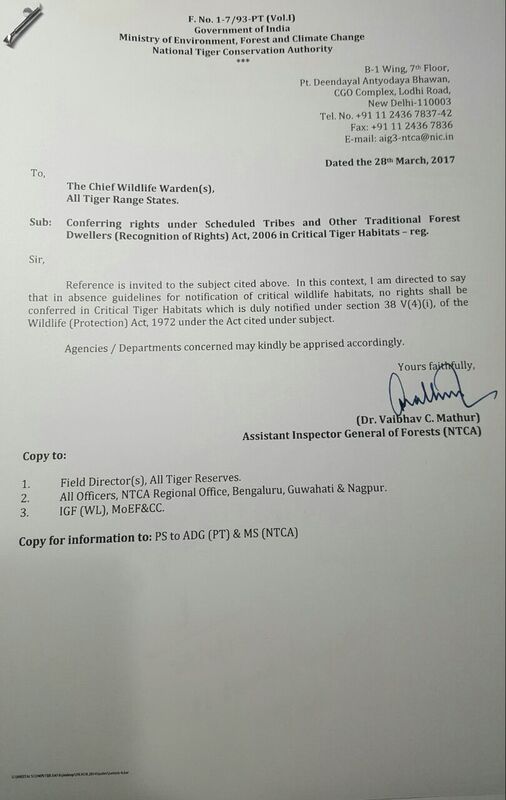 On March 28th, the National Tiger Conservation Authority passed a grossly illegal order (copy here) in which they directed all states to not recognise any rights under the Forest Rights Act in so-called “critical tiger habitats.” This will is a criminal offence against the rights of over four lakh tribals and forest dwellers. From start to finish, India’s tiger reserves have been plagued by illegalities. Even prior to the passage of the FRA, in 2005 the Tiger Task Force condemned forest authorities for “selective application of the law”, which had led to what it called “truly a war within, exploding inside reserves and taking everything else in its wake.” In 2006, the law was amended to require scientific evidence and a public process before deciding which areas are truly critical for tigers. But in 2007, in a mockery of the law, the Centre simply notified all of India’s tiger reserves as “critical tiger habitats” without bothering with any scientific process at all (see this note for more information). Now this order comes as a further attack on people’s rights. On the ground, forest officials have already begun to use this order to threaten and harass forest dwellers. In tiger reserves where rights were already recognised – such as in Simlipal in Odisha – forest officials have even demanded that recognised rights should be canceled. This would be a double crime and a further atrocity. To oppose this criminal order, the Campaign will be mobilising protests and village level meetings, where whole villages will send protest statements to the government. These will take place across the country in the next month. We also understand that other opposition parties are likely to take the issue up, and that many other democratic groups will be mobilising against it.